Exciting news! 🙂 Thanks to Google cache, KC’s original Star Card Season 1 Guide and Review has been found! Although Soshi Dreams is no longer active, we would like to present to you his comprehensive guide. All credits go to KC! Please credit him if you intend to use this outside of SoShi Catalogue. This entry will be fairly long so my sincere apologies beforehand. I have been asked by dozens of collectors to post my final thoughts on the SNSD Star Card collection as I was one of the first collectors to ‘complete’ my set. I will be posting a formal breakdown of the entire collection for others to reference and learn from. As well, I will finish off with some final thoughts on pricing, trading etc. Hopefully this serves as a helpful resource to all of you, cheers!!! To start off, a very very basic orientation. 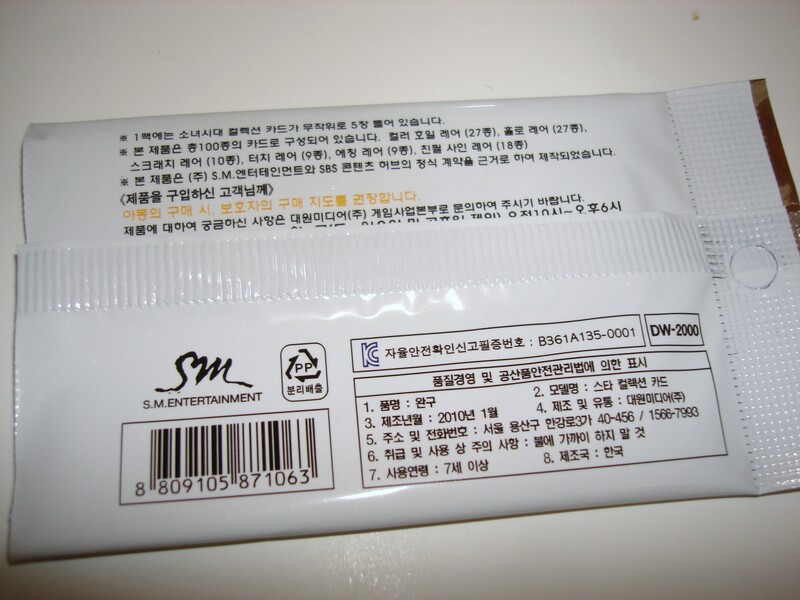 SNSD Star Cards are official SNSD goods distributed and copyrighted by SM Entertainment. They were released in Korea in late 2009 through Gmarket, Everysing and several other major distributors. Ok so the first thing people ask me is how many cards there are in total. What I have done below is taken group photos of every card categorized by series ie. 002, 003 etc. As well, I will post what rare card variations there are for each series and post a photo or two for an example. Let’s begin! This series is the first of the regular set. Because 001, 004 and 009 series card are so so rare, you will find that many collectors will not even attempt to complete those three sets. Series 002 is a great series, you may notice that the members are in the same outfits they are in for the 001 series. This series of cards is highly coveted because they are not as common as the other regular series AND they use images from a photoshoot not previously released. I call this series Sporty but, call it whatever you want hahaha, there is no official name. So, this series comes in two variations as well but a quick note. The rare variation of this card is called an “etching variation.” Some people thought there was two types of rare card, an ‘etching’ version and a ‘checkered’ version. After consulting with some other collectors, it looks like there is only one variation. I have posted a pic of the front and back of the 003 cards in regular form. 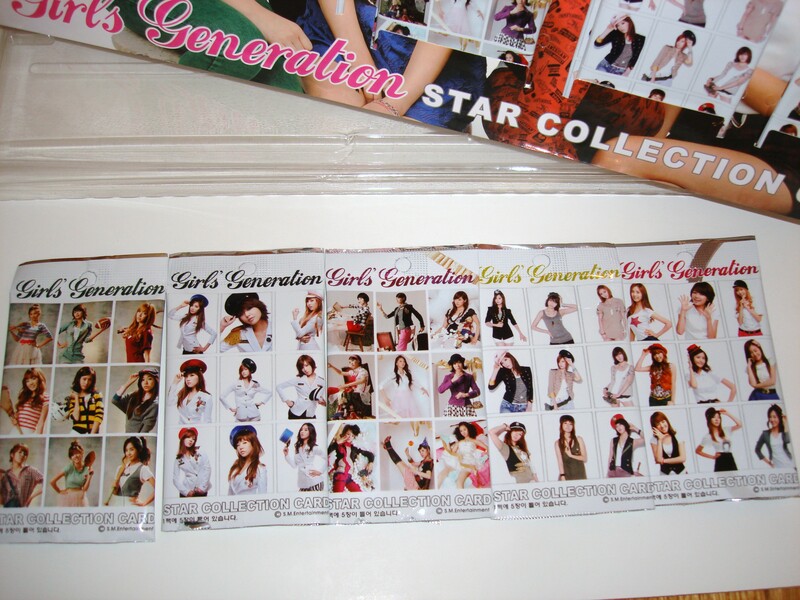 Below the group photo, a few individual scans of the rare variation for Taeyeon, Yoona and Yuri. I currently have 5 etching cards but will not be going for all 9. The rare variation of 003 series can be considered similar to 001, 004 and 009 in that they are quite rare. Collecting all 9 is possible but would be very difficult. This series is just like 006 in that there are three variations: regular, holo and checkered holo. 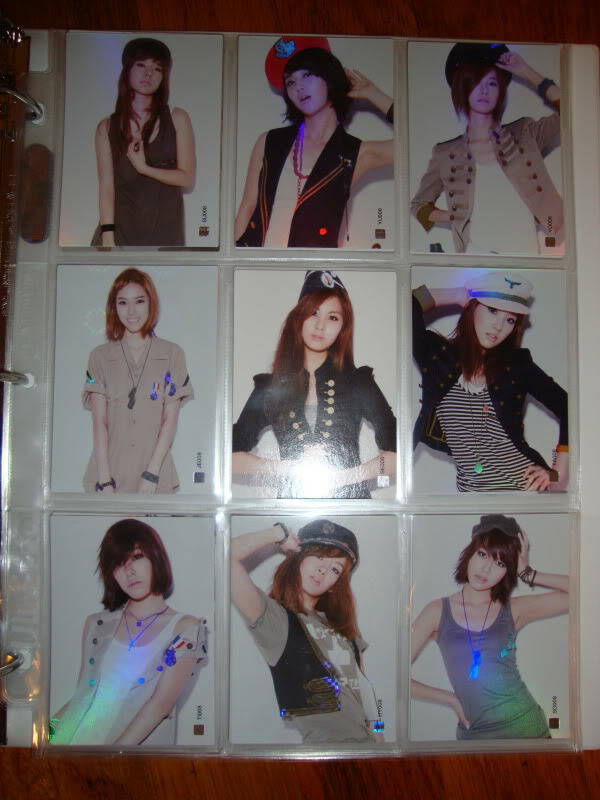 Taken from the First Album Doll shoot, the regular cards are very easy to find, especially the sunny ones hahaha, the Sunny 007 broke a record at our office with a whopping 31 spares lol. I have posted a group photo of the 9 regulars front and back. Below that, a photo of all 9 regular holo’s and lastly, a Yuri 007 checkered holo so you can see the difference. 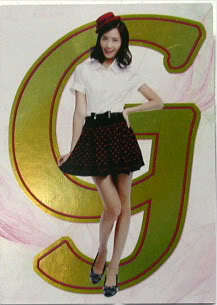 The tenth and final series of SNSD Star Card Collection release 1. Two variations, regular and foil name. Nothing special here, pretty easy to get all 9 regulars and all 9 foil names. It took me almost 2 months of collecting, trading and ebaying to complete my entire collection. Was it fun? Definitely. Would I do it again? Hopefully not for another few months hahaha. Many ask me how much money I spent in total. I am guessing between buying the sets from Gmarket, bidding for group cards and rare cards etc, I spent close to $600US. Keep in mind I didn’t bid on any 001 or 004 cards so I think $600 is pretty reasonable for the collection I have now. Although I did not technically finish the entire collection as I am missing random checkered holo’s here and there, I got pretty darn close and am content. A big issue people have been coming to me about is the flood of Star Cards on Ebay. A month or so ago, there was nothing on EBay but nowadays, there are literally hundreds of cards up for auction which is kinda cool to see. There are even some sellers offering entire series like 002 foil x9 etc. for the lazy collectors hahaha. I am pretty sure if I was starting from nothing right now, I could get an entire collection in 2 days or less and spend maybe 1/2 of what I did previously which is pretty insane. 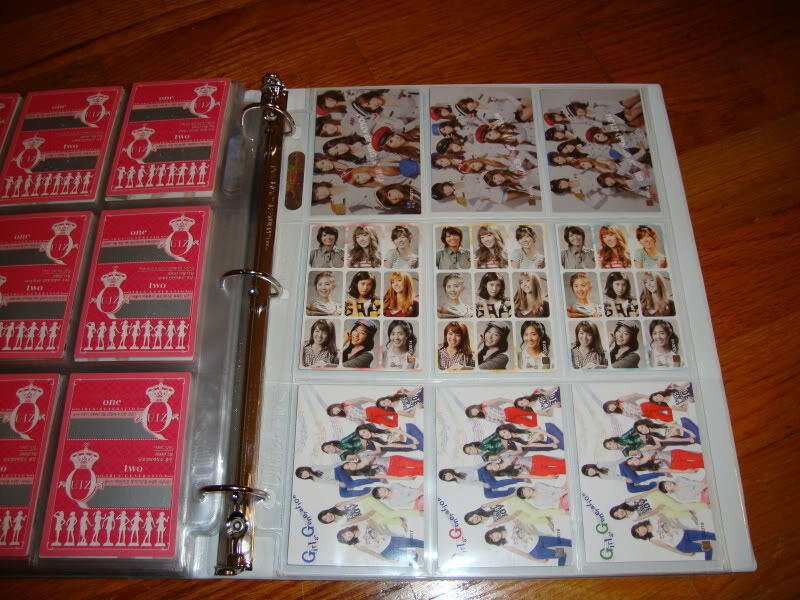 In closing, I am no formal authority on SNSD Star Cards. All I am is a normal SNSD fan that really enjoys collecting stuff. Many SONE’s have been coming to me to set precedent on the prices of rare cards, set regulations on what should be traded for what etc, but quite honestly, I don’t think I am qualified. I will always give you my honest opinion of what a card is worth but at the end of the day, only you can do what feels right to you. Do I think a Yoona 003 etching card is worth $200US? Absolutely not as I got 1 by trading 2 group cards worth maybe $30US. 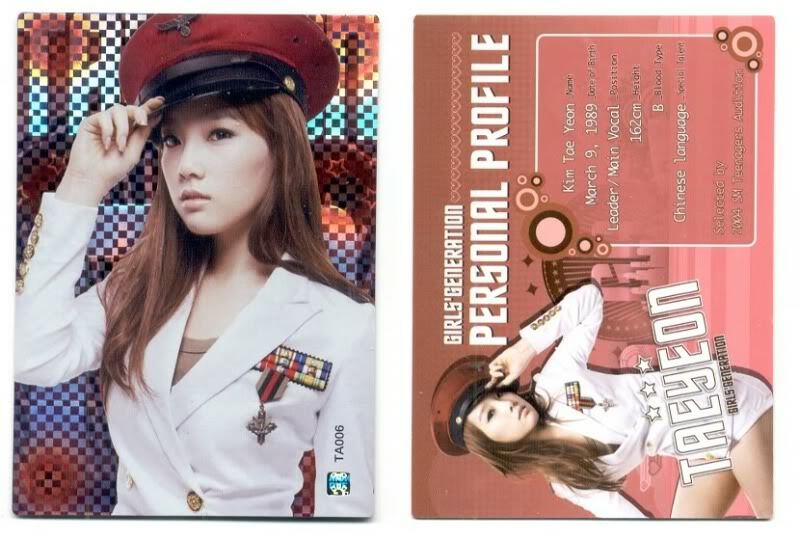 Do I think a signed Taeyeon 001 card is worth $2000US? Absolutely not but you know what? If a collector is willing to pay that much, good for him as long as he is being fiscally responsible and staying within his means. thanks for reposting this Guide. I was searching everywhere. Which thickness point should I get for Piece cards? Thanks. I'm so curious about the 009 cards. 😮 but I can't find anything on them. hi, are the autographed series 004 & 001 for sale? thnks.